Crayola Dry-Erase Activity Center: $7.99 + Eligible for Free Shipping! 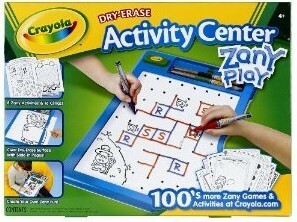 Right now at Amazon, you can get a Crayola Dry-Erase Activity Center Zany Play Edition for only $7.99! This will ship for free with your purchase of $25 or more. This currently costs $15 at Walmart, so it's a pretty nice deal! Unique to market activity with interchangeable templates that slide under a clear dry erase surface allows kids to modify the board content with their imaginations. Many elements for fun innovative in its simplicity.